Carbon dioxide has been increasing in the atmosphere, and the increase is attributed to human activity. These activities include industrialization, daily use of energy and fuel, and changes in land use. The scientific evidence indicates these activities are very likely the primary cause of the observed increase in Earth's average temperature since the mid-1900s, and the rising temperatures that are driving climate change. To cope with the changes, people of all nations will need to mitigate, innovate, and adapt. These concepts are summarized in the Take Aim at Climate Change video. All people contribute to increasing global carbon dioxide levels, from burning wood in Africa to driving to the grocery store in the United States. We each can make innovative choices or look at ways to mitigate our carbon dioxide output, reducing the rate of carbon dioxide increase. While individual actions count at the local level, the actions of large groups of people will show results on a global scale. For example, during the 2008 Olympic Games held in Beijing, China, local officials took steps to improve air quality, including restricting traffic and temporarily closing factories. Analysis of data from NASA's Aura and Terra satellites showed a 50% reduction in the levels of nitrogen oxides and a 20% reduction in carbon monoxide levels in Beijing and eastern China. The major source of these atmospheric pollutants is the combustion of fossil fuels occurring primarily in cars, trucks, and power plants. Since these are also sources of carbon dioxide, it follows that carbon dioxide production also fell during this time, though it was not directly measured. This unintentional atmospheric experiment supports the idea that the actions of a large group of people, such as the population of Beijing, can produce a measurable change in the atmosphere. A significant point to keep in mind is that while the goal in Beijing was a short-term improvement in air quality, sustained reduction of carbon dioxide emissions will have longer-term consequences. But how can this be accomplished? Cities are crucial to mitigating climate change, as half of the world's population currently lives in urban areas. According to ICLEI - Local Governments for Sustainability, in the year 2050 an estimated two-thirds of the world's population will reside in urban areas producing 75% of greenhouse gas emissions. NASA satellite studies provide evidence of urban growth. For example, Atlanta, Calgary, and Curibba, Brazil each grew in area by 25% from 1990-2000. Surprisingly, in terms of energy use per individual in urban areas of the United States is lower than the overall U.S. average. However, in developing countries such as China, individual energy use in urban areas is almost twice the China national average. However we count and wherever we look, changing the carbon use of cities has the potential to dramatically alter the amount of carbon dioxide released into the atmosphere. But where should we start? Nadine Unger, a NASA Scientist proposed that the best approach is not to focus on a specific gas, such as carbon dioxide. She suggested we focus on economic sectors where emission reductions would be most beneficial and provide the quickest return for improving the environment. Examples include animal husbandry, household biofuel, and transportation. In the short term transportation is the major source of carbon dioxide emissions and other pollutants in our atmosphere especially in cities, as can be seen by examining data from the NASA AIRS program. Developing countries such as China are rapidly increasing the number of vehicles in use in large cities. Even developed countries show an increase in the use of transportation as populations continue to grow. As pointed out by Unger, it is in the transportation sector where we as individuals can make a world of difference in the short term. As a start toward addressing the transportation sector, the U.S. Environmental Protection Agency (EPA) and the National Highway Traffic Safety Administration (NHTSA) propose new standards for these types of trucks: combination tractors, heavy-duty pickups and vans, and vocational vehicles. For combination tractors, the agencies propose engine and vehicle standards that start in the 2014 model year and realize up to a 20 percent reduction in carbon dioxide (CO2) emissions and fuel consumption by the 2018 model year. Hoping to show the benefit of these measures, NASA has asked your team to use an Earth system science analysis to demonstrate the impact. Your team has been asked by NASA to carry out an atmospheric science investigation for developing a community-based strategy to reduce the human production of greenhouse gases for a major urban area near your location by improving air quality. Your plan should focus on the transportation sector. The investigation will require baseline information about the rate of increase of atmospheric carbon dioxide*, nitrogen oxides, and carbon monoxide downwind from your location during each season from a recent year using MY NASA DATA, Giovanni or NASA's Eyes on the Earth sites. The proposed plan should include details on how individuals can reduce their carbon output,the goal for carbon reduction,images showing distribution and values of the gases downwind from your urban area, and which satellites should be tasked to collect information. The final document should also include an ESS analysis prior to the implementation of the plan and following implementation of the plan. A primer on accessing and using NASA data and tools is available here. Your team has been asked by NASA to carry out an atmospheric science investigation that employs a community-based strategy to reduce the human production of greenhouse gases for a major urban area near your location by improving air quality. Download worldwide carbon dioxide* concentration data from NASA AIRS using My NASA Data, Giovanni, or NASA's Eyes on Earth. 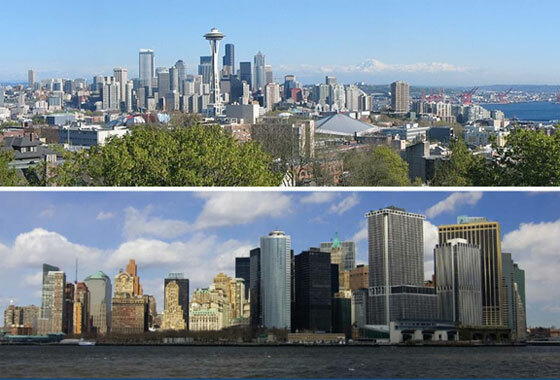 Identify two urban areas that are located in two different geographic regions. Develop community-based mitigation strategies in the transportation sector that are culturally and regionally appropriate, specify a reduction goal, funding needs, and how to achieve inclusive participation. As a key part of the analysis include baseline seasonal images of air quality gases and carbon dioxide. Estimate how these will change over a period of three years after full implementation of your plan. The final document should also include an ESS analysis prior to the implementation of the plan and following implementation of the plan. A primer on accessing and using NASA data and tools is available here. *Special note on data related to carbon dioxide: While reducing carbon dioxide output is the ultimate goal, the data on carbon dioxide is difficult to interpret. Carbon dioxide mixes with other tropospheric gases and is driven by upper level winds, making a direct correlation between carbon dioxide and city location difficult to determine. You will observe this when you try the Metropolis game. Do not despair; carbon monoxide and nitrous oxide data are excellent proxy (i.e. stand in) data for carbon dioxide production since these are also byproducts of combustion and will be very useful in completing this task. 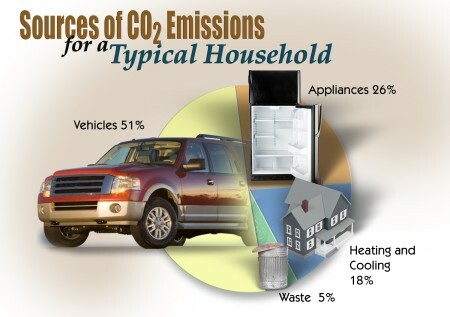 About half of a typical U.S. household's carbon dioxide emissions comes from driving their family cars. More on households emission sources. Image: Courtesy fueleconomy.gov. The website provides detailed information about how carbon dioxide in the atmosphere is related to the earth's temperature. A primer on the types of air pollution produce by the fossil fuel-based transportation sector. The article explores the impact of and ability of the Earth to have more cars on the road. The growth of the number of cars on the road is a major consideration for planning future city growth. NASA AIRS (Atmospheric Infrared Sounder) is an instrument on board the Aqua satellite. It can detect atmospheric concentrations of ozone, carbon monoxide, carbon dioxide, methane, and dust (see Composition on the AIRS website). While this global view does not permit pinpoint observations of major cities since the measurements are not at the surface level, it does provide an indication of the source regions and areas to focus mitigation efforts. While visualization of the data collected by AIRS is described on the site, you can see the data by using NASA's Eyes on Earth 3D and selecting the Aqua Satellite. This is an excellent site as it provides not only a view of the gases indicated, but also a short video clip explaining the visualization. An additional item on the site, that would also make a worthwhile classroom investigation, is the game Metropolis that is accessed through Eyes on the Earth 3D. The resource is a good kid-friendly website that gives the basic information about the greenhouse effect. This article outlines steps you can do to reduce your carbon footprint. There is ongoing research on how to not only save energy by moving to electric and hybird cars, areas that should be explored in the development of the scenario, but also efforts to improve fuel economy. The main link will take you to the Department of Energy/EPA website to look at ways of improving driving, but do not limit your search. There is work going on worldwide to reduce carbon emissions in the transportation sector - from road trains, to basic research on driving. A nice graphic comparing different modes of transportation is How far can I travel on 1 ton of carbon dioxide. The article is based on the work of NASA scientist Nadine Unger. Unger proposed instead of tracking chemical species (e.g., aerosols, carbon dioxide, sulfur dioxide, etc.) to mitigate global warming, that it would be better to track different economic sectors, such as transportation, power production, and agriculture amongst others. Her work identified the transportation sector as the one with the greatest potential to reduce carbon dioxide emissions in the short term. In 2050, the focus should move to the power sector. The article is very insightful, and useful for planning mitigation strategies. A companion article that should also be examined is Transportation Pollution and Global Warming. An example of how how to build these modules. This one addresses alternative energy which could be a valuable resource for the Carbon City module. The activity is designed to investigate the relationship between atmospheric carbon dioxide levels and chlorophyll-a measurements in a local watershed. The website is a rich collection of resources, some of which deal with mitigation, data, trends, and several interactive activities. The information here can support classroom presentations, student explorations, and possible investigations. You can also connect to Eyes on Earth 3D from this central location. Beginner: There are several links to materials appropriate for beginning students. Advanced: There are several links to materials appropriate for advanced students. Metropolis is a must do game! The game is accessed through the Eyes on the Earth 3D link. After your enter Eyes you will find a link to click to load the game. The purpose of the game is to observe a NASA AIRS image of carbon dioxide concentration on the Earth and rub out the image to locate the major cities of the world. The game establishes the connection between global distribution of large concentrations of carbon dioxide, cities, and the effect that the winds have on moving the carbon dioxide from the source region to other parts of the globe. The game clearly illustrates the role of cities and burning as major sources for carbon dioxide. This is a chapter in the Earth Exploration Toolbook. Students Image J and NASA Earth Observations (NEO) satellite imagery to track carbon in the Earth system. The activity is a straightforward investigation on interpreting data sources on greenhouse gases. The question posed by this module is what energy sources should a community use as it prepares for the future. One aspect of energy use in a community is transportation. The Sustaining My Community with Renewable Energy module could be used as a lead-in or follow-up to Carbon City. Advanced: The module includes a tasking option for advanced students.